I cooked my chicken in oven for 20 mins at 400 degrees, when cooked let cool. Cook sliced zucchini on cook top low heat until tender. 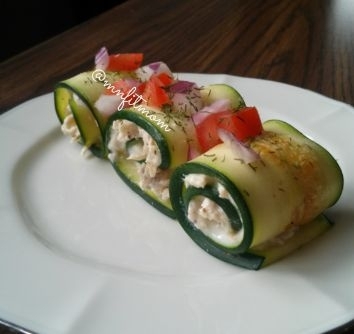 In a bowl mix chicken and first 5 ingredients in a bowl, spread with knife on zucchini slices and roll, top with your favorite healthy ingredients I used red onion, tomato, and dill.